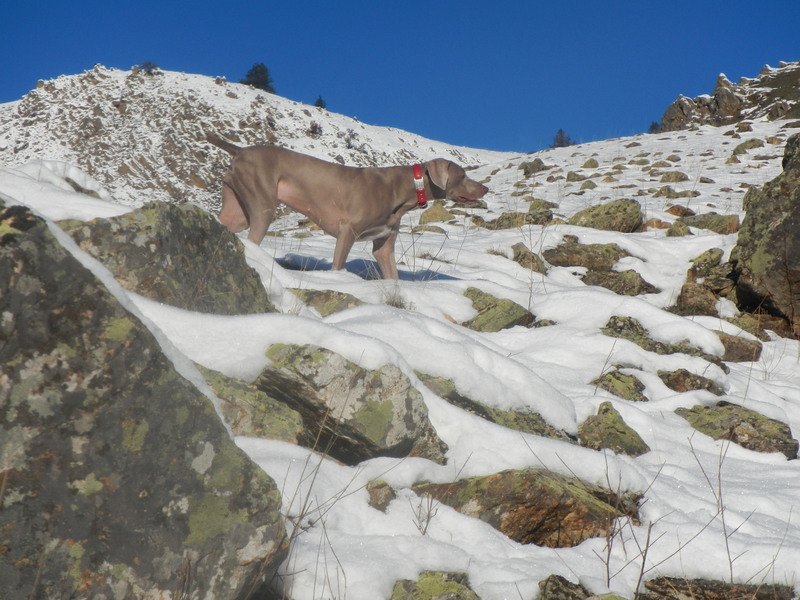 Holy Moly, how did nearly a full chukar season slide by without any more diatribe from me on this blog-log? 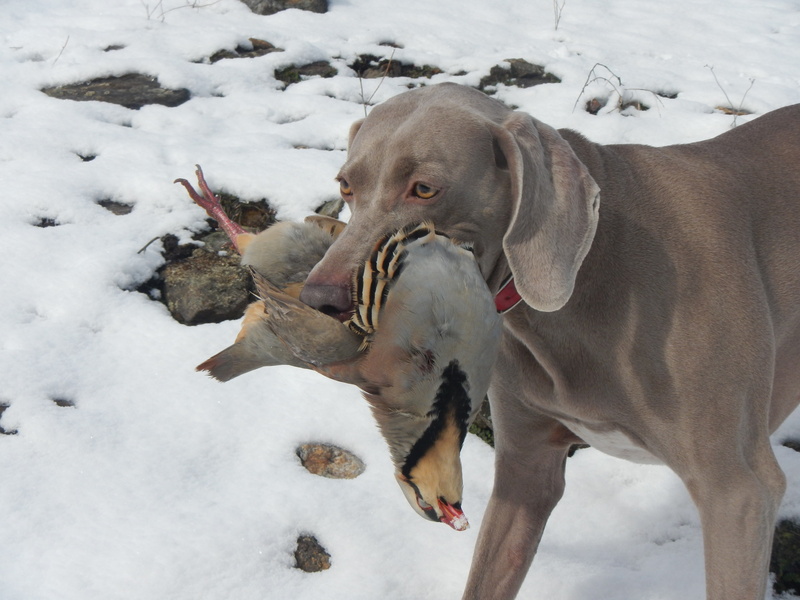 While I would like to claim I am crazy about hunting chukars, and I am, my preference would be to claim that too much time was spent behind a shotgun than a keyboard. 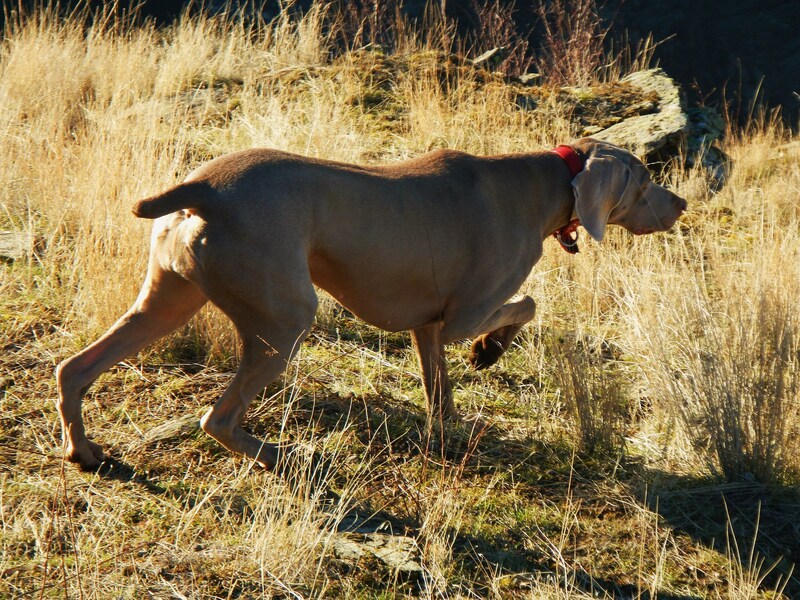 However, the truth is chasing chukars isn’t just a little jaunt up the hill, so it isn’t like I am after them everyday. So there is ample down-time, to write. I’m just not that crazy about writing. For me, writing is a bit painful and the agonizing attempt to render much of the adipose out of brevity is ever the frustrating challenge. 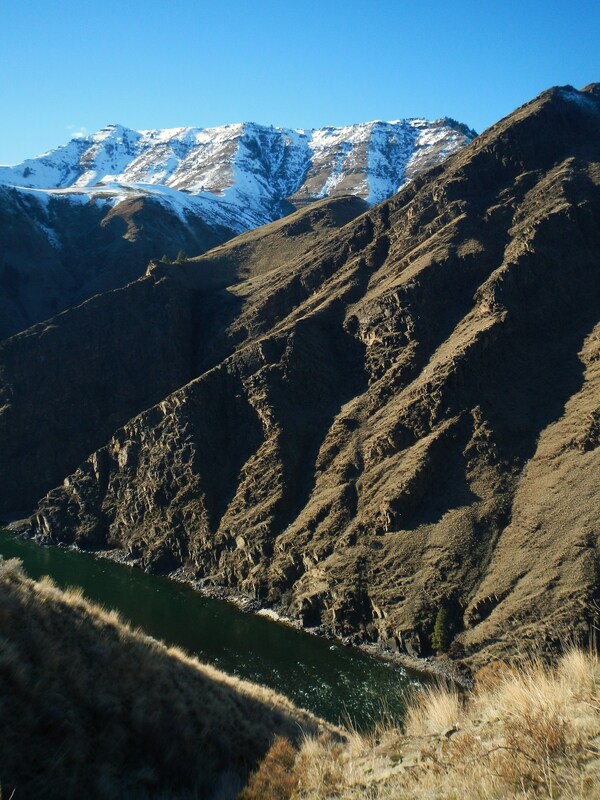 It would be wonderful if only that word laden fat was as easy to burn off, as is the extra weight when climbing the steep chukar slopes. Writing is more like having some sort of addiction that urges one to want to write some kind of story. The fix is complete once the story if finished, but once more experiences make more stories, the addiction to write them down returns again. In truth, I much prefer making the story, than writing about it. But in the telling, is the chance to relive the tale again and savor the experience, warts and all, as well as share with others. Since it is a new year, I decided to force myself to sit down and try to come up with some new idea or twist on chukar hunting. It is often said (mostly by chukar hunters themselves) that one must be crazy to be a chukar hunter. But, just what does that mean exactly? It has a tendency to get lost in the backwash of all the other crazy happenings in an ever-escalating troubled world we live in. All the religious fundamentalist fighting over having the only legitimate ticket into lala land, added to all the rebel rousing militia-misfits battling over public vs private, “rights fights,” about who has the more legitimate ticket to be on real land, topped off by true mental madness of those driven to mass murder by who knows what trigger, taken collectively, indeed seems to paint a pretty insane world. Surely, there must be some natural reason for all this mayhem of the human mind. What might that be? Some evolutionary biologists, archaeologists, and psychosociologists have a few theories for this madness. It may all have begun as a food thing. As the human population increased, so did competition for finite natural resources, and thus various limiting factors developed when carrying capacities of nature’s box was exceeded. Genetics, natures blueprint for making sure everything fits inside the box, sometimes works in strange ways. While survival of the fittest is the general rule, it would seem that natural selection would weed out the gene for mental illness (crazy), as those that are so inflicted have a tendency to have fewer off-spring. Yet “crazy” still persists, as their more sane siblings often make up for the deficit and have more progeny. Thus a sort of paradox arises when it comes to natural selection and what gets selected for, or not, in the gene pool. A similar paradox might be said of chukar hunting. It would seem like the gene for crazy would promote more chukar hunters, but survival of the fittest rules here, because those not in good enough physical shape to make the arduous task required to reach chukar habitat, despite being crazy, are soon weeded out. 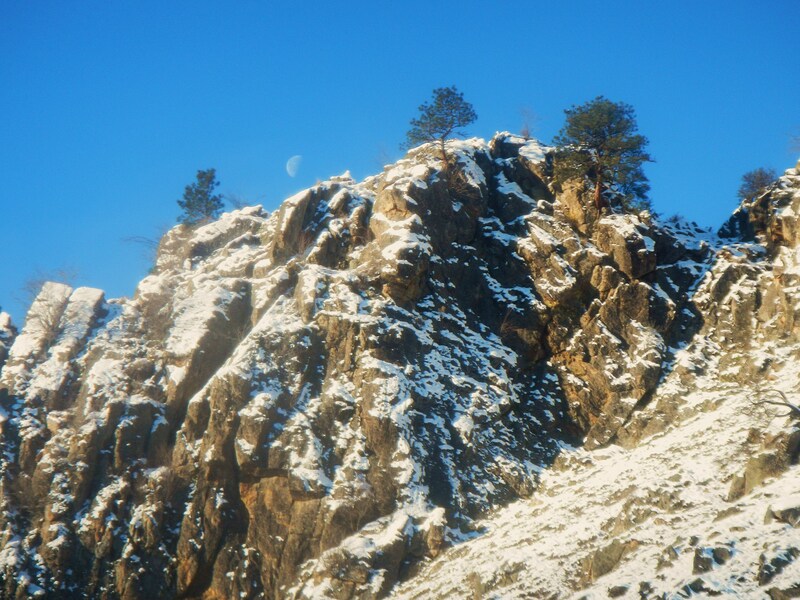 While standing at the bottom of a magnum trench, like the Salmon River Canyon, knowing that birds are high and those ugly cliffs and side slopes far above are where I need to go, does seem a bit crazy. But once one foot gets placed in front of the other one, before you know it the river is far below. Hunting mode kicks in and after being on the hill, all those other cultural and societal problems get lost in the background. Negotiating the terrain, while itself is contributing to more personal positive health, the focus changes to take in the smaller detail of the more immediate world. One careless stumble can avalanche into chaos and in some cases even death. Of course, along with the plus side of health for those who don’t slip or get unraveled, comes the frustrating aging parts, too. One of those aggravating revelations that denial can’t deny, is the keenness of eyesight that diminishes deceptively incrementally with time. How I have come to know this is by such things as looking closer at what I initially thought was chukar poop, but turned out to be a partially leached out snail-shell of similar size and coloration. Then comes that crazy thought gene again, with absurd ideas that bubble to the surface. You know, like wondering if I can hear the sound of chukars when I pick up one of those snail shells and put it to my ear. It would be like hearing the sea in a conch shell (sea shells) when finding one when strolling along a sandy ocean beach and unable to resist putting it to my ear, or so it seems. 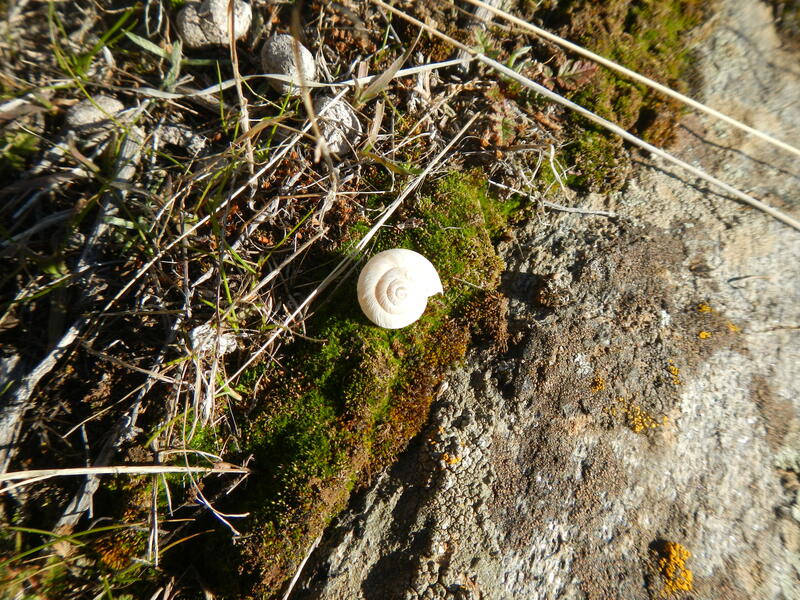 Ok, granted a chukar call would work much better, but finding a snail-shell in such weird places does strike my more curious nature. Like, what kind of snail is it, how did it get here, and why? Ironically, near as I have been able to key it out, the snails in the Salmon Canyon are called Salmon Coil (Helicodiscus salmonaceus). 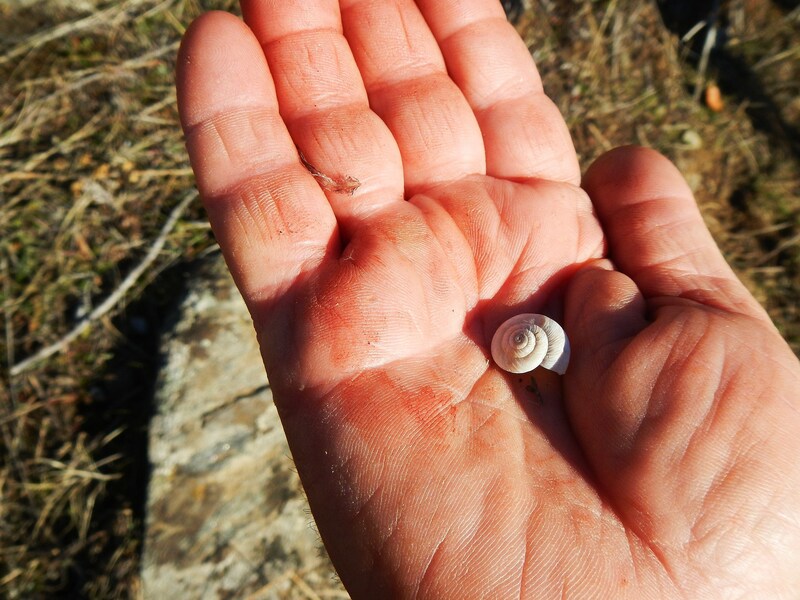 Even more fascinating is that they are hermaphroditic – which simply means one snail shares a common male and female gonad internally and thus is capable of self-fertilization. 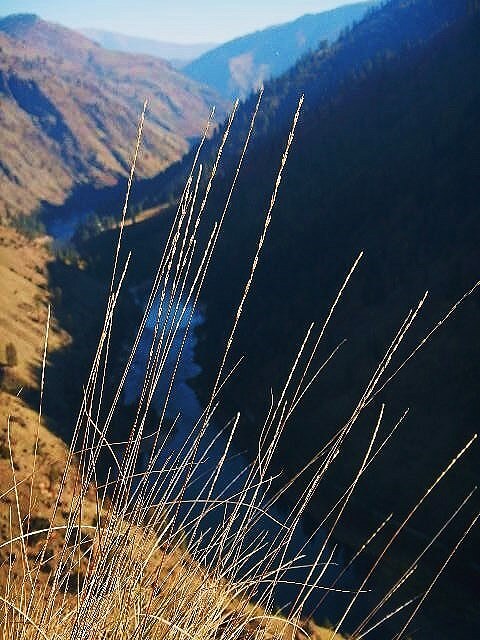 When I first discovered them high on the steep slopes so far away from water in the river that looks more like a trickle from such great distance, I thought maybe birds had dropped them there. A slugs pace would take eons of generations to reach such altitudes. It reminded me of my river running days amidst the glaciers of Alaska and learning about nunitaks (island of rock or small landmass in the middle of a vast ice field) and how they could harbor small mammals like the alpine pika. How did they get there and continue to survive? Did a pregnant one get dropped by a bird, too? Or did they get isolated by ice flows before they were surrounded by glaciers, yet still able to survive? Of course, the mystery deepens as I look closer at the snail shells and it occurs to me how their near spiral design is similar to a faraway galaxy. While all planets spin around the sun and their own axis in the same direction, not so with galaxies or some snail shells. They are an example of chirality, which describes anything that has a symmetry that is not a mirror image of itself, but rather contains a right or left-handedness. It is all related to mathematics and the “Fibonacci” in nature. (google it for some interesting revelations about nature and numbers). Crazy round-about questions are suddenly interrupted by the sudden flush of a chukars and is all it takes to bring me back to my senses. Where is that dog, anyway? On point where she should be, of course, while I am side-tracked by my own brain and holding snail shells to my ear. Earth to Gary. Pay attention I tell myself, as birds are out of range before I can lift to shoot. Those birds have plenty enough advantage for me to contribute even more by getting lost in my own thoughts. Continuing on, Sugar points a few more coveys and I miss a few more hard shots, and an easy one, too. But, other things grab my attention in the process, like a herd of bighorn sheep scrutinizing a four legged potential predator as she advances their direction, and two golden eagles in tucked-wing-dive-mode-locomotion hot on the tail of a terrorized chukar kicking in the after-burner trying to make its escape. It’s downright awesome to watch and reminds me of how susceptible I am to dropping my jaw and becoming totally spell-bound. Watching first hand the predator-prey relationships that animals live with everyday reminds me, that yes, survival of the fittest is the name of the game, and is the dominant gene-theme to continue forward with in raw nature. It is easy to forget that when the “crazy” gene surfaces and is not pounded back down into the dark recesses of wherever those things reside. Sometimes denial is a good mechanism for suppressing our sub-surface recessive or oppressive “c” genes. I wonder if it is just coincidental that both crazy and chukar start with the letter “c” ?? 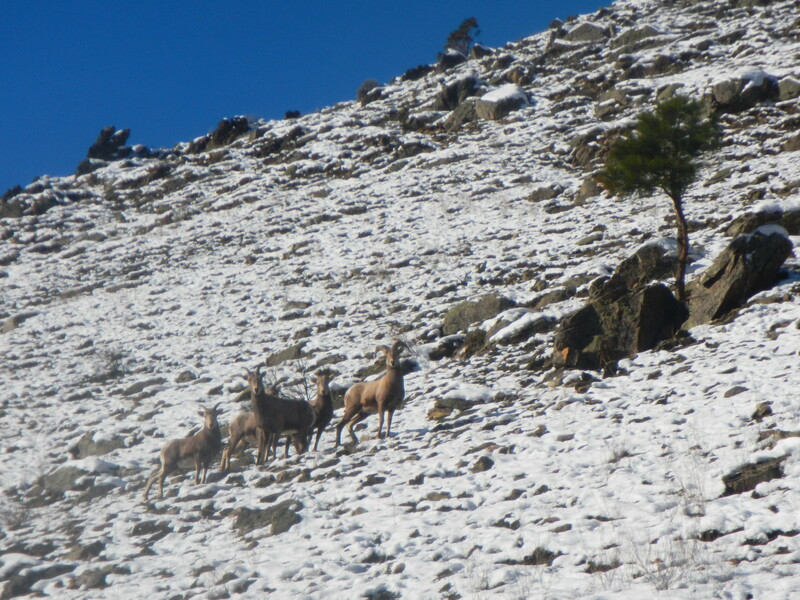 Just another day in chukar paradise.